The session began in the village of Cha, where Leng had just married Min, and also obtained the Wind Sabre of Sunan. The village celebrated the wedding for several days and during that time Weng Zhang realized that Min’s breaking away from Heiping, along with Leng’s desire to keep the Wind Sabre, placed him in a difficult position. He came to the conclusion that the head of his Mystic Sword Sect, Lady White Blade, would punish, possibly kill him, for failing to bring her the sabre and for failing to prevent the great shame of Leng and Min’s marriage. Weng attempted to take the sabre in the middle of the night, but was blocked by Shu. By marrying Leng and giving him the Wind Sabre, Min violated her oath to the Heiping Sect, and the leader of the Sect, Queen Lu Zhi, would no doubt hunt them down. The party decided to travel south, as far as possible to help them evade both Heiping Sect and Lady White Blade. Because he can’t use swords, Leng gave Min the Wind Sabre to use on their journey. Word traveled fast though and on the second day of their journey they were ambushed by members of the Mystic Sword and the Heiping Sects working together. There were six foes in total. Before combat began, Weng Zhang attempted to convince the members of Mystic Sword Sect that he was still trying to get the Wind Sabre and was not a traitor. They demanded he stab Leng to prove his words, which he attempted but failed. Combat began, and in the first round Shu used the Eagle Descends Loudly to throw Weng Zhang thirty feet into the mud (who then chose to play dead until the end of the battle). Over the course of the battle, Min was wounded, but the others escaped unscathed. The Wind Sabre proved very effective in the fight, killing several Mystic Sword member and a Heiping disciple. In the end, the party killed all but one of the Mystic Sword disciples. Weng Zhang forgave Leng for trying to stab him. The party revived the one surviving member of the Mystic Sword Sect, but he taunted Leng for being a cowardly traitor so Leng stabbed him to death. The party continued on, but failed a second Survival Skill roll, and therefore were unable to avoid another group trying to intercept them, the Tsun River Gang. This time, Chief Frowning Eagle, had two allies from Zhaoze sect: The Venom of Zhaoze and Little Venom (the daughter of the former). The Chief had been humiliated by the party in their last encounter but still wanted the Wind Sabre. As Frowning Eagle demanded the sword form the Party, Shu derided the leader’s martial abilities and parlayed directly with The Venom of Zhaoze. It became clear in the course of the conversation both shared an enemy in Heiping, and that the party would make better allies than enemies. They spoke about the possible fallout of Leng’s marriage to Min, and their acquisition of the Wind Sabre, deciding a conflict between some of the sects was likely but could work to their advantage. They agreed to form an alliance and Shu promised to speak to the head of his order, The Nature Loving Monk sect to arrange a future meeting. We conducted our third playtest over Google+ Friday. This was a short session with just two players, but it went well (next week we will have all four players and go full length). Until I secure permission to use peoples names and characters, I will simply refer to participants as Players A, B, C, and D for these reports. Just to provide some context, the game is set in a place called the World of Man or Qi Xien, this is the setting. Until about the last hundred years or so, martial heroes served the Empire, up through the reign of The Righteous Emperor (Zhao). However, the Righteous Emperor died, his son Zhan (The Glorious Emperor) changed policy radically and ruled with tremendous cruelty. Eventually his excesses pitted him against many of the martial heroes. Those willing to serve the wicked emperor were forced to join the Yao office, a kind of secret police force. Those who rejected the emperor joined forces with rebels in the south. Ultimately the rebels lost most of their territory (they presently hold on a small portion of southern Hai'an). The martial heroes retreated to the Jian Shu region, a land of mountain valleys and lakes that is something of a frontier just beyond the emperor's reach. Our campaign is set in the Tsun River area of this region. 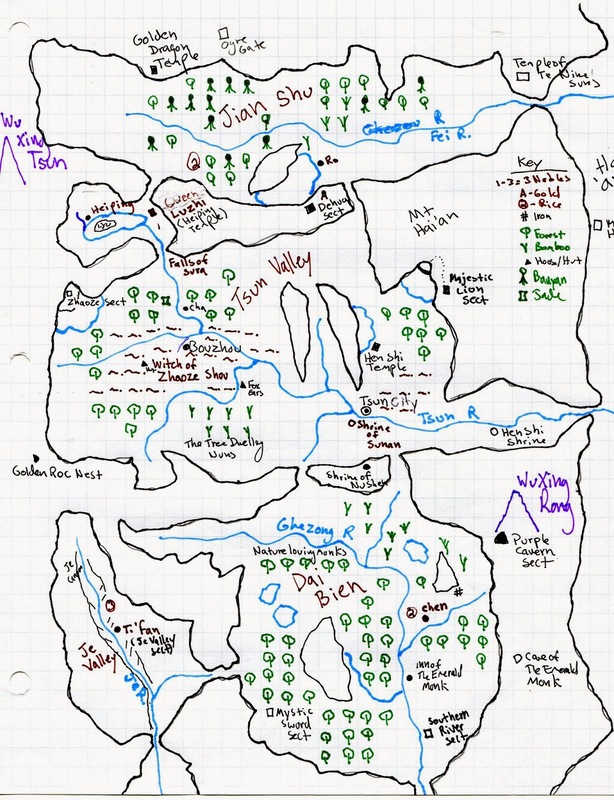 I pasted my crude hand drawn map of the setting to the right. When we prepare this for PDF it will be converted to a proper hex map. The Jian Shu region is pasted here on the right. This is again my personal hand drawn version. I should note it is incomplete. 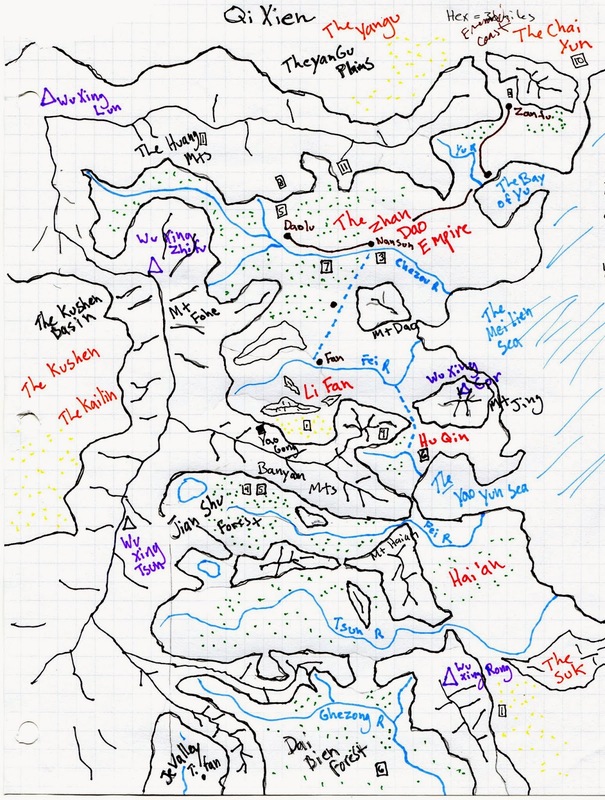 I haven't finished fleshing out the map yet, but am continuing to do so as I build the campaign. You may not be able to see it, but this is done on graph paper, and these will be converted to hexes when we get a proper map made for Wandering Heroes of Ogre Gate. This is just context to help readers understand the world our players were exploring. In the last session, the characters had recovered the Wind Sabre of Sunan, and given it to the nuns of the Heiping Sect. One of the nuns, Min, fell in love with Player A, because his fate flaw makes him the object of affection among a number of competing admirers (I wrote about Fate Flaws HERE). They also came into conflict with the Tsun River Gang and their leader, King Frowning Eagle because the party participated in the killing of the Witch of Zhaoze Zhou to get the Wind Sabre in the first place. Player C decided this growing grudge needed to be dealt with, so he convinced the leader of Heiping to send Min with the group to reach an agreement with the Tsun River Gang in the town of Bouzhou (where Tsun River headquarters are located). On the way, they went back through a village called Cha, where they had previously heard rumors of a swordsman with supernatural powers killing villagers. Player B decided they should investigate the matter briefly before continuing to Bouzhou. They circled back to Cha and went to an inn. Player B snuck out in the middle of the night to search for the swordsman, while Min and Player A discussed the Wind Sabre. Min revealed that she had taken the Wind Sabre from Heiping with the intent of giving it to Player A if he agreed to marry her. This would be a violation of her oath to the sect however and make both of them enemies of Heiping. Player A (who adheres to an unorthodox code) agreed and gained the Sabre. During the night, Player B spotted a figure on a mound just outside the village. It was a woman with glowing white eyes, holding a spear and sword. She attempted some kind of supernatural stare on Player B, but he was able to use his Great Stride Technique and re-appear behind her. The woman's hands glowed and spectral claws emerged from her hands. She landed an attack and Player B took one wound (player B attempted a block but failed). Player B spotted a golden medallion around her neck and attempted to throw her, taking the medallion. He failed to do so, but did push her back a few feet. She charged forward with her spear, preparing a heavy impaling strike. The game has techniques called counters, which allow you to interrupt attacks or redirect missed attacks, and Player B used a counter called Iron Reversal Technique, which caused her spear to spin around and impale her with her own attack and momentum. He then followed with a maneuver called The Eagle Descends Loudly, throwing her into the air and bringing her crashing down to the ground. The force of the fall, was enough to knock her out. Player B brought her back to the party. They examined her medallion and deduced that she was a hero from the south known as The Fearless Rival, very well thought of respected. They concluded she had somehow imbalanced her Qi and been possessed by a Vulture Spirit. Min was able to purge the spirit, and The Fearless Rival was thankful, offering to assist the party whenever they had need of her sword. The next morning Min and Player A were married a Shrine to Hen-Shi (The Compassionate Daughter) and this is where we ended the session. We found a lot of things this session. First, it was unclear in the text how anyone possessed by a spirit is purged and what the exact mental effects are (how much control the player has over his character). So this was fixed in the manuscript. We also altered the existing rules, since we didn't quite like what we had. I think it is an improvement but we won't know until next session how well it works. We also found one Technique that ends right in the middle of a description of how it works (we could intuit what was meant, and fixed the text). We also decided to fiddle with how Martial Ranks and Balance works. We made some significant improvements here. Sertorius goes into layout this week and should be out in PDF soon (the print release will follow in the coming months). Beneath the Banshee Tree: A mystery adventure set in the city of Talyr. This will hopefully be out in PDF the same month as Sertorius. Beneath the Banshee Tree will be free. Book of the Archon I: This is a free PDF of new spells. It contains as many spells as the core rulebook, offering more varied power levels. This will probably be available in the second or third month following Sertorius. The Wandering Heroes of Ogre Gate (Book of the Archon II): This started as a book of new spells and turned into a Wuxia variation of Sertorius. It can be used on its own for adventuring in a Wuxia setting, or the Kung Fu Techniques can be brought into a normal Sertorius game. Wandering Heroes of Ogre Gate will be free. More Books of the Archon: The Books of the Archon will be ongoing and tailored to specific flavors. Future Books of the Archon might include Classic Sword and Sorcery, Supers, and more. All Books of the Archon will be free PDFs. More Modules: We hope to have more modules as things develop. We conducted our second playtest of Wandering Heroes of Ogre Gate through online video chat last night (the playtest report can be found here: REPORT). The session went well, but we did run into mic issues initially. Once that was sorted out things ran smoothly until one of the player's was temporarily disconnected. So playing online, while convenient, definitely has its own drawbacks. I think going forward this will be manageable and despite these issues, we still had a solid night of gaming. I talk about some of the mechanical observations from the playtest in the report link above. Here I think I can maybe go over some setting elements. One of the things really driving the direction of the campaign it seems is the sects. There are four players, and three belong to different sects, while the third is independent. The first belongs to the Mystic Sword Sect, led by the very severe and punitive Lady White Blade. The second belongs to The Temple of the Nine Suns, led by Laughing Fox and known (at the present moment at least) for their devotion to self indulgence). The third belongs to the Nature Loving Monk sect...essentially a group of wandering beggars. The adventure started with the first two characters, when the heads of Temple of the Nine Suns and Mystic Sword sect allied to find the Wind Sabre of Sunan. The other two characters are essentially along for the ride or for their own secret purposes (it is unknown which is the case). The party's search for the Wind Sabre led them to the Witch of Zhaoze Zhou and to the Heiping Sect. They don't know the history very well, but are aware that the witch once traveled with her husband, and that he was killed in a conflict with Heiping Sect. She then avenged her husband's death by killing the head of Heiping and taking the Wind Sabre. So now Heiping is also looking for the sword and to avenge their fallen leader. They have had a tense relationship with Heiping which turned into a kind of alliance by last session. Both Heiping and the party were present at the death of the witch. The Tsun River Gang, who are loyal to the witch and call her Li Sou Chao, confronted the part for revenge. Now the party and Heiping are working together to deal with the Tsun River threat. Another complication is the sword. The party was instructed to retrieve it, but now it is in the hands of Heiping, who seem to have a legitimate claim to it. So they are debating how to handle it. The PC belonging to the Mystic Sword Sect is the most concerned because Lady White Blade has been known to kill her own disciples for any hint of disloyalty or significant failure (and the sword ending up in the hands of Heiping could be seen as both). The PC belonging to the Temple of the Nine Suns is far less concerned, and almost willing to hand Heiping the blade (because Laughing Fox is unlikely to care that much). So it is interesting to see how the various loyalties are playing out. It is also interesting to see how the independent player is reacting, because his primary concern seems to be avoiding conflict between Heiping and any of the sects connected to the party. This is all stuff that developed organically in play, through the sects based on where everything started and what choices the players made. On top of that one of the players took Fated as a flaw, and that is in the process of creating a potentially very dangerous situation for the party (which I will explore once the situation has fully unfolded at the table).